Anyone else in the mood for a salad? Aside from Thanksgiving last week, my family was stricken with a terrible gasto virus the weekend before. I can honestly say that this is the first day that I can even “think” about eating leafy, fibrous greens! For the past week, all members of my family (except our keto kid) have been surviving on pure carbohydrates… something we don’t usually do anymore. Pancakes, noodles, toast, bananas and applesauce have been in abundance. On Thanksgiving day, we were recovered enough to eat turkey dinner, but appetites were still not back to normal. Now that we are fully recovered, I am happy to say that I am once agin in the mood to cook and eat healthy food! 1. Wash the kale very well and make sure all the sand is rinsed off. I find that submerging it in a (clean) sink filled with water is the best method. Allow it to dry on a towel. 2. Remove the center stalk and finely chop the leaves. I like to cut it into long thin shreds. 3. Weigh the amount of kale needed for a ketogenic recipe. 4. Lightly salt the weighed portion of the kale. With your hands toss the salt with the chopped leaves and squeeze the kale as if you are forcing it to bruise and wilt. The kale is very hearty and can take it! Let it sit for at least an hour to break down and soften up. This is the key to enjoying kale in the raw state, the salt helps break down the toughness and bitterness. 5. Toss with the salad dressing and enjoy. Now on to the recipe! 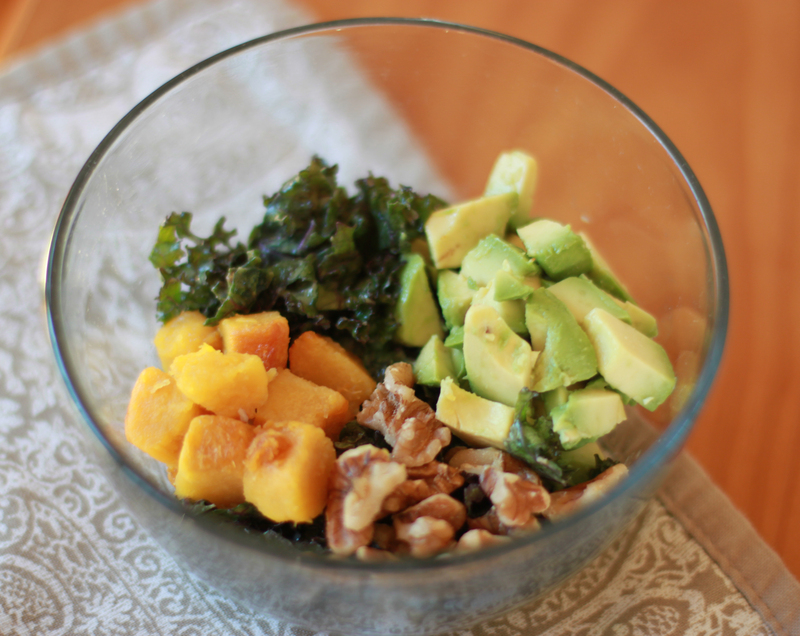 This is packed with vitamins from the kale, squash, avocado and walnuts. It makes a good cool weather salad, especially if the squash is still warm. Add some roasted chicken breast to increase the protein for a complete meal. The sweetness from the squash and the dressing really make this an enjoyable salad since the kale can be on the bitter side. I hope you enjoy! Combine the olive oil, tahini paste, lemon juice and seasonings together, stir until they are well combined. Toss the dressing with the kale. Add the additional toppings and serve.